The genus Echthronomas Forster, 1869 and two species, E. facialis (Thomson, 1887) and E. quadrinotata (Thomson, 1887), are recorded for the fauna of Ukraine for the first time. Descriptions and photographs of species are provided. 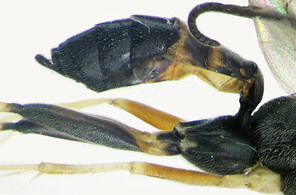 Echthronomas is a small genus of the subfamily Campopleginae (Hymenoptera: Ichneumonidae), represented by twelve species in the world, including four in the Western Palaearctic region ( Yu et al. 2012 ). 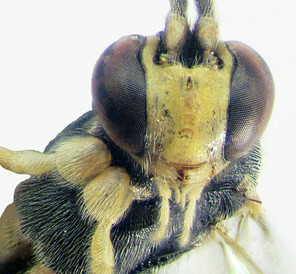 With the exception of E. quadrinotata (Thomson, 1887), Echthronomas species, which are endoparasitoids of lepidopteran larvae, are rarely collected ( Horstmann 1987 ). Specimens were collected by sweep netting on Corylus avellana in beech forest (Transcarpathia) and near branches of dead Picea abies in the mixed forest (Precarpathia). Specimens were identified using Horstmann's ( Horstmann 1987 ) keys. Specimens were sent to Klaus Horstmann and he confirmed identification. Terminology followed Townes (1969) . The generic diagnosis is that of Townes (1969) with minor modifications. Fore wing 5.3 to 8.0 mm long. Body short and stout. 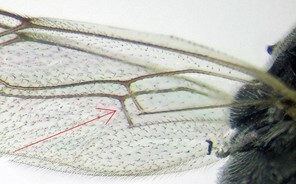 Eye margin indented opposite antennal socket. Clypeus small, its apex convex. Mandible short. Lower tooth of mandible a little shorter than upper tooth. Temple short. Mesopleurum matt and with strong punctures. Propodeum short, with or without well defined carinae, its basal transverse carina more or less distinct, other carinae not always present. Areola and petiolar areas, when defined, broadly confluent. Propodeal spiracle circular. Tarsal claws pectinate. Areolet pointed or petiolate. First metasomal segment slender. Glymmae present. Metasoma compressed. Thyridium subcircular, separated from base of the second tergite by 0.2 to 0.6 its diameter. Ovipositor as long as apical depth of metasoma. This genus is distinguished from other Campoplegine genera by combination of the following characters ( Fig. 1 ). b: Spurs of hind tibia. Female. This species is easily distinguishable from all Echthronomas species in having a punctate propodeum, without traces of carinae, yellow frons (inner margins of eyes), face, clypeus, mandibles, malar space ( Fig. 2a ), tegula, scape and pedicel, black metasoma with tergites II–III apically yellowish and black hind femora ( Fig. 2b ). The other three species of Echthronomas have propodeum with traces of transverse carinae, entirely black frons, at least partly black face, at least partly red metasoma and red hind femora. a: Head and fore coxae (frontal view). b: Metasoma and hind femora (lateral view). Female. 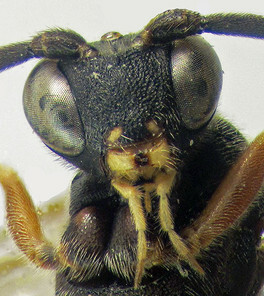 This species is easily distinguishable from all Echthronomas species in having a transversely wrinkled propodeum, black clypeus with two yellow lateral spots, black face and malar space ( Fig. 3a ), black fore coxae with red (yellowish) spots, black metasoma with red postpetiole apically and tergites II–IV ( Fig. 3b ). b: Metasoma and hind femora (dorsal view). Echthronomas tricincta (Gravenhorst, 1829) differs from Echthronomas quadrinotata (Thomson, 1887) in having entirely yellow fore and mid coxae, clypeus, and malar space, partly yellow face, and a black metasoma with only red apically tergites II–IV. Another species, Echthronomas ochrostoma (Holmgren, 1860), is similar to Echthronomas quadrinotata (Thomson, 1887), but differs in having a yellow malar space and clypeus (sometimes with a small black central spot) ( Horstmann 1987 ). Eilema sp. (Arctiidae) ( Horstmann 1987 ). I wish to thank Klaus Horstmann for his help with the identification of species, Alex Gumovsky for help in the preparation of the manuscript, Alexey Reshchikov, Gavin Broad, Matthew Yoder and one nominated reviewer for useful suggestions and correction of the English text. 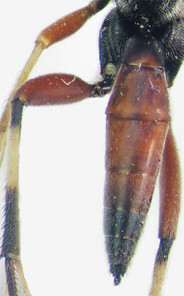 World Ichneumonoidea. Taxonomy, Biology, Morphology and Distribution.